Mumbai: Sachin Tendulkar’s son Arjun was the cynosure of eyes at the Wankhede Stadium here on Friday as he bowled to the likes of Virat Kohli and his Indian teammates at the nets. 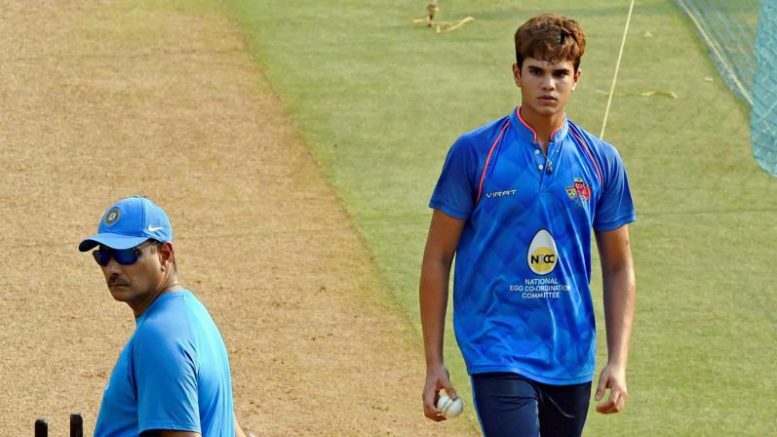 Watched by India head coach Ravi Shastri and bowling coach Bharat Arun, 18-year-old Arjun bowled at the nets as soon as the team’s training session ahead of the three match ODI series against New Zealand began at around 4.15pm. Arjun bowled first to left-handed Shikhar Dhawan and then to Kohli. He also bowled to Ajinkya Rahane and middle order batsman Kedar Jadhav among others. He also seen interacting with Bharat Arun. It’s not new for Arjun to bowl at the nets as he had done the same to the women’s team at the iconic Lords before their ICC World Cup final against England. Arjun, who wasnamed in a Mumbai U-19 squad for an invitational tournament, is a budding left-handed seamer. India: Virat Kohli (captain), Rohit Sharma (vice-captain), Shikhar Dhawan, Ajinkya Rahane, Manish Pandey, Kedar Jadhav, Dinesh Karthik, Mahendra Singh Dhoni (wicketkeeper), Hardik Pandya, Axar Patel, Kuldeep Yadav, Yuzvendra Chahal, Jasprit Bumrah, Bhuvneshwar Kumar, Shardul Thakur. New Zealand: Kane Williamson (captain), Martin Guptill, Colin Munro, Ross Taylor, Tom Latham (wicketkeeper), Henry Nicholls, Ish Sodhi, George Worker, Glenn Phillips, Matt Henry, Colin de Grandhomme, Mitchell Santner, Tim Southee, Adam Milne, Trent Boult. Be the first to comment on "Virat Kohli and co face Sachin Tendulkar’s son Arjun in nets before 1st India-NZ ODI"